After a half-hour ferry ride, we landed in Supetar where we were to pick up information about our accommodations in Milna and a rental car. Our first stop was the tourist information office which supplied us with a map to the Maestral agency with whom we had booked our accommodations. The helpful lady used a large marker to indicate the route to their office. Our next stop was a small car and motor scooter rental office where we rented a small Fiat. We threw our bags in the back and with our trusty map in hand, set out for the Maestral office. We started following the route indicated on our map only to find that it went down the waterfront - which was a pedestrian mall. Looking at the map, it seemed that we could drive several blocks up the hill, turn north, and reach the Maestral office. We gave this a try, driving up the hill and turning at the first street that looked like it might go through. The street quickly became quite narrow. Undaunted, we turned downhill and proceeded slowly. Several hundred feet down the hill there were stairs - this was no street. A local Croatian lady walked up to the car, but she didn't seem to speak English and, other than a few phrases, we didn't speak Croatian. We showed her our map (with the thick black line obscuring the street names). She studied it and, with hand gestures, indicated that we needed to go back up the hill and back towards the rental shop. We returned to the rental shop and showed the proprietor our map. He shook his head and rolled his eyes when he saw the pedestrian route marked on the map. He pulled out a fresh map and marked it up with a new route that first took us south, then turned north above Supetar before turning downhill to the Maestral office. Feeling much better, we set out again and quickly found our way to the top of the town. Our next problem was that street signs seem to be hit or miss. It took several tries to find the right street, and we had to resort to navigating by looking at the map, and then "turning left three streets after the sharp curve by the water". We found the local Maestral office and, though they seemed to have closed for the afternoon, we were soon sitting on the patio with their agent. 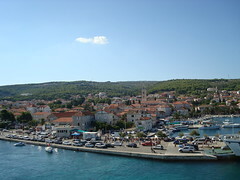 The agent wrote out a voucher for our stay in Milna and then very patiently and thoroughly went over many of the attractions on Brač. 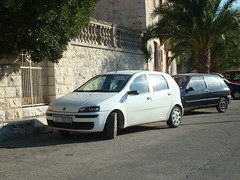 At the Maestral agent's suggestion, we stopped by a little town called Bobovisca on the Sea on the way to Milna. He told us that it was a small fishing village basically unchanged by time. He was quite correct. Up the hill from Bobovisca on the Sea, we stopped to take a picture of the village of Ložišća. It was a few minutes after 5 p.m. and the church bells started ringing, which seemed a little strange. We hopped in the car and proceeded up the hill. The road went from a narrow road with one lane in each direction to a very narrow one lane road. As we rounded a bend, we noticed the reason for the church bells. Dozens of people in a funeral procession, complete with pallbearers and a casket, were making their way across the street and down to the church. We switched off the engine and waited. The rest of the trip to Milna was uneventful. The countryside was very rocky and stone walls and olive trees were plentiful along the road.